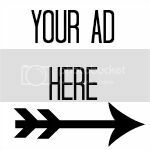 What do you get when a girl is in love with Mod Podge and book pages AND has a set of boxes that are in serious need of a face lift? 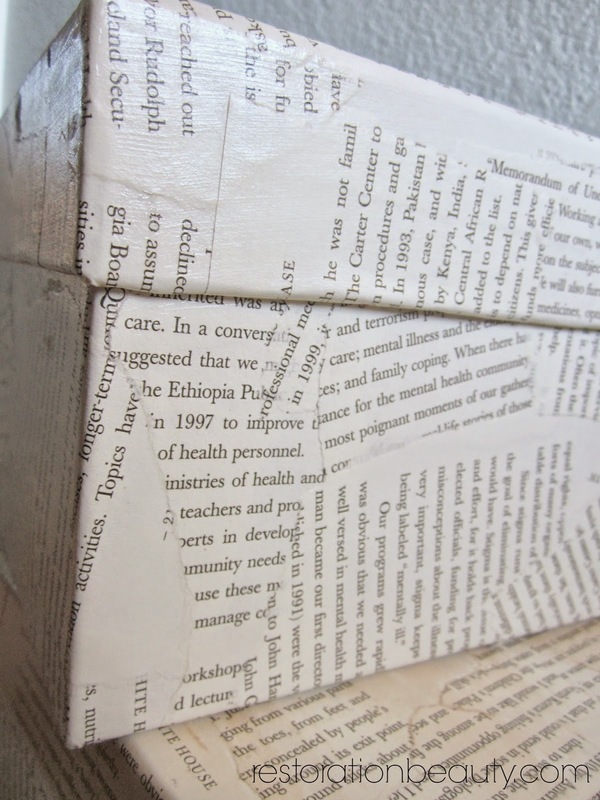 You get these fabulous DECOUPAGE BOXES USING BOOK PAGES. 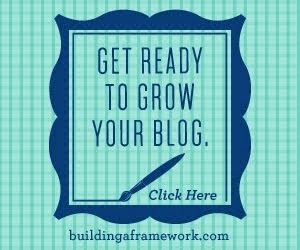 But I'm sure you already knew that from the title. Smarty pants. 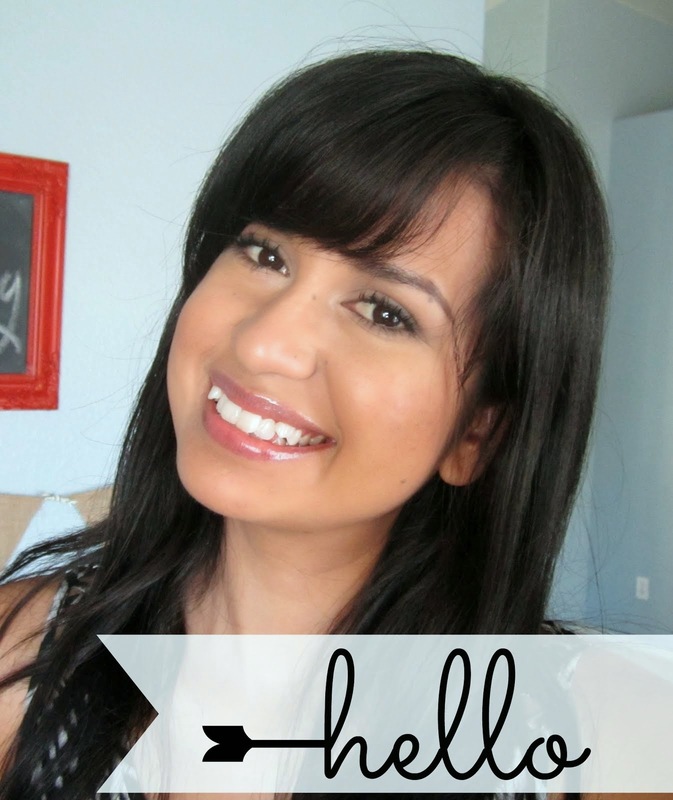 It's kind of like faking a face lift with makeup instead of actually going under the knife. "Under the knife" in this instance meaning buying a new set of boxes. If you know me, you know I get quite the kick out of giving old, ugly, trash worthy objects a second chance with makeovers. And a second chance did these boxes get! If you read my post on my DIY Rustic Coat Rack & Creating a More Functional Entryway, you'll remember me stating that I planned a little project to unify the set of boxes I was using as a side table. The colors and styles were all over the place. From neutrals with french words, to nautical, to golds and browns. They were such an eyesore grouped together but I just loved the height they provided as a side table so I had to come up with a solution! 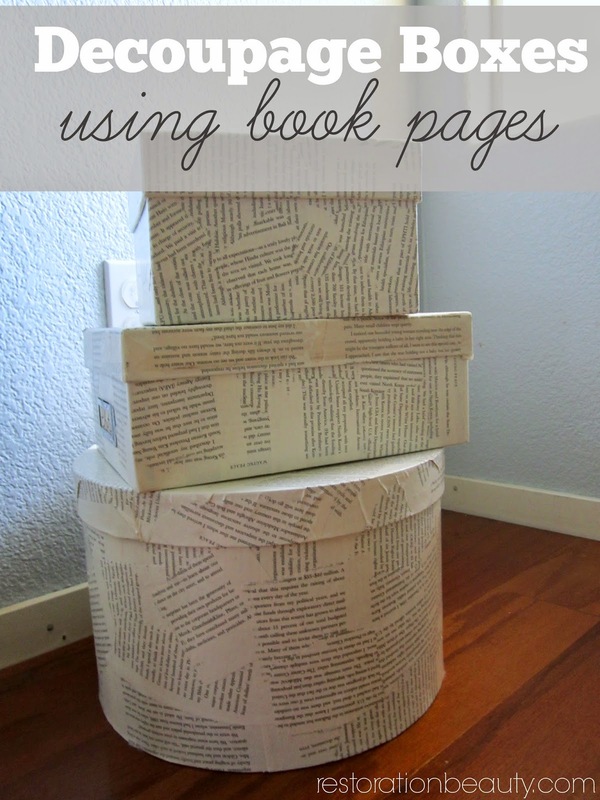 Since I had recently made my Book Page Wreath and Book Page Trimmed Lampshade and just loved how the book pages looked in our home, I knew that a set of book page boxes would be a nice addition to incorporating book pages in my home. Geez, how many times can I use the phrase "book pages" in a sentence. Evidently, a lot! 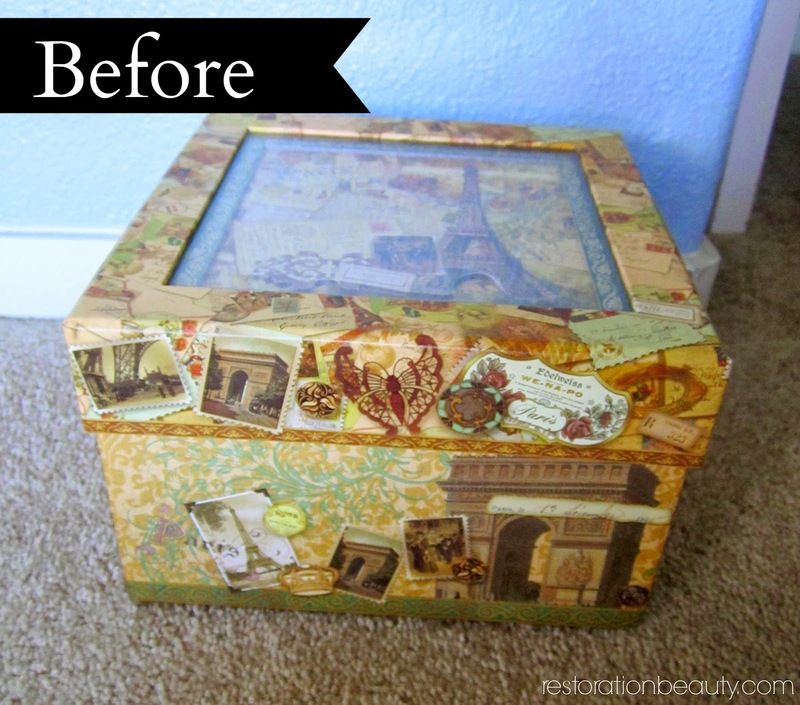 I'm sure most of you reading already know how to decoupage. It's so easy, so fast and quite fun! Except for the messy part! Or does "messy" just happen to me? I used my trusty Mod Podge and book pages from a Dollar Tree book to cover my boxes. 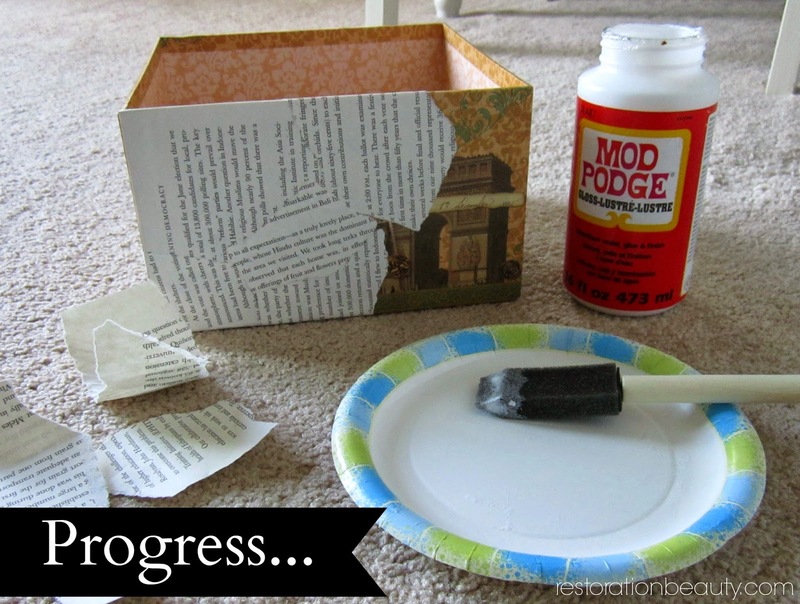 I just covered one side of a piece of book page with Mod Podge and smoothed over the boxes one piece at a time. Most of the Mod Podge may or may not have ended up on my hands and pants. You could leave the pages whole for a more uniform look but I just tore the book pages in pieces and randomly applied them to the boxes. 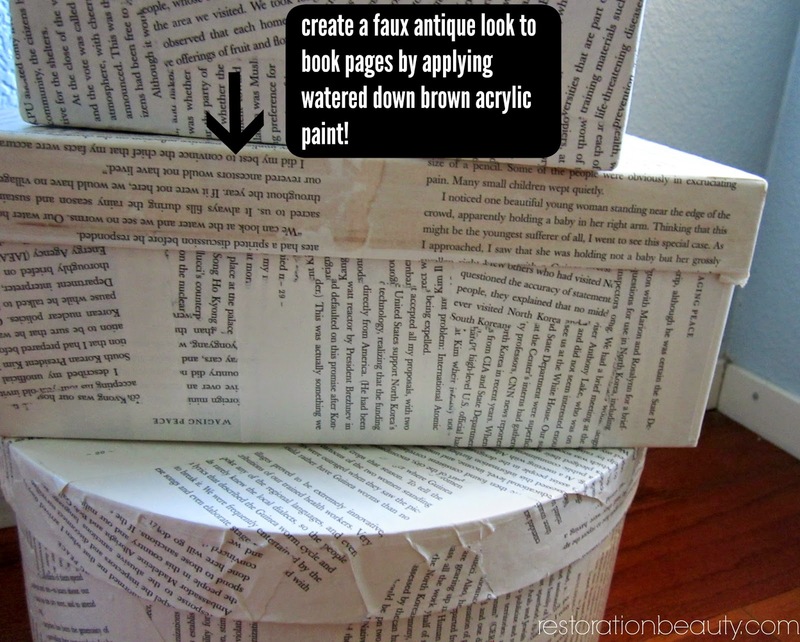 If you want to give your book pages an aged look, you can do so by watering down brown or gray paint and rubbing it on the book pages (already glued to the box) with a paper towel. I did this to a lid of one of the boxes to see how it would turn out. I loved the effect but decided to keep the rest new looking. 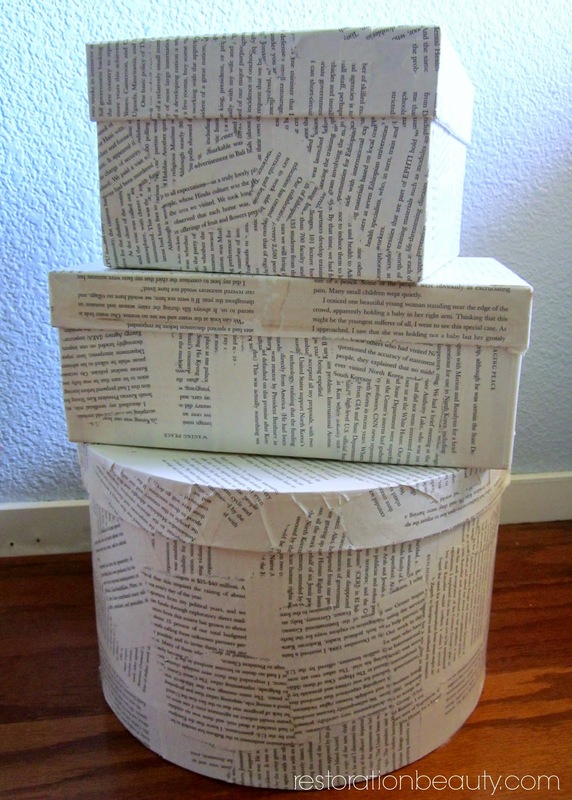 Once I finished covering each box with book pages, I applied a generous coat of Mod Podge to seal the whole thing. 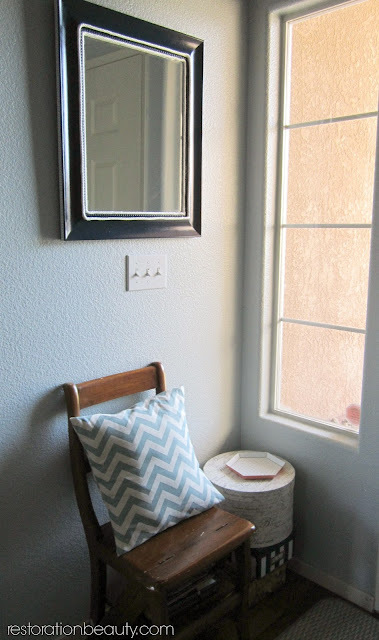 Goodbye eyesore and hello pretty and neutral boxes! Amazing what some book pages, Mod Podge and 1 hour made happen. I may have ruined a pair of pants and a manicure, but it was totally worth it! Thanks so much friend! Mod Podge definitely rocks! As do book pages!